Warband needs a HUD to create a depth and understanding into the character that is not provided solely through the narrative. The creation of a HUD lets the player believe this is them, acts as a warning system to alert the player to the scenarios facing them, and provides information about the character and environment. 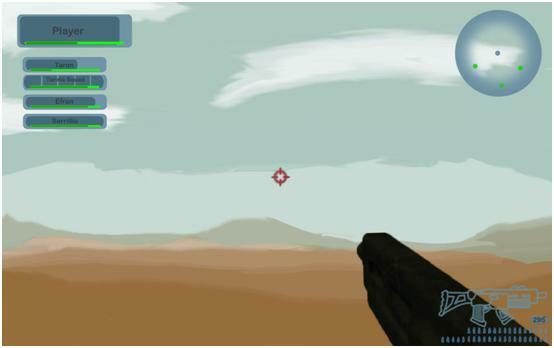 As a first person shooter, the player has to be given a rather basic HUD as only limited information is needed for the player. This HUD will have to act as a Warning to the player to make sure they know what their character’s personal current information is. As a role playing game, the HUD needs to be rather more complex than a standard FPS HUD. This will be done by creating additional menu systems to give in depth in game character creation. Overall the design for the HUD will have to compromise ideas of both RPG and FPS games design. The best option for this will be a in depth HUD hidden between current information needed for the player, and information needed to sustain enough immersion for the player in their in game character development. Crosshair – The central focus point of the HUD for aiming melee and projectile weapons. Heath – Both current and total amount of heath for each character. Experience – Current Experience earned and total experience until next level. Weapon – Single current weapon being used and alternative weapons which can be interchangeable. Ammunition – Current levels of ammo for said weapon attached to this section. Rift Proximity – When the player nears a rift, an indicator should appear, becoming a deeper purple colour the closer the player gets (get later in game). Squad Status – Current and total status for accompanying characters in the players party. Mini Map – Player will gain a mini map later in the game. Character – Accessed by pressing H. Shows information on the character. This will allow in-depth character building which leads to different ideological rules for the player character. The information displayed will be the character’s level, experience, experience needed to gain a level, skills, skill points and attribute points. Inventory – Accessed by pressing B. Here all information regarding the player’s current monetary situation is kept, also information about items which the player is carrying in his or her backpack. Quest Log – Accessed by pressing L. Information into the player’s current quests, including those that are outstanding, current, completed, and progressed. This will be split into three areas: Current Main Missions, (the player’s objectives and motivations in the level/game world), Current Quests (objectives that play little part in the overall story arc and Completed Missions and Quests (shows what the player has done). This is only available in Campaign. Map – Accessed by pressing M. This shows the player their overall geographical location in a top down 2D format. This will be broken into three parts: these are local, zone and world. The local map will be a full zoomed in map, showing areas of importance to the player in this localised zone. The zone map will include the areas immediately zoomed to include areas of geographical importance for the player as well as areas that are immediately surrounding the current location depending what sector or area it is in. The world map will show the location of the player in the entire continent. The world map is only available in Campaign. Three key points have to be looked into for building an optimised HUD for Warband. These include the minimisation of a HUD to create a dramatic first person shooter experience. To provide the correct amount of information to the player to create fluid character creation and game play. The immersion of a playing experience that makes the play feel the HUD does not hinder them but benefits them in showing every aspect of the game ability, in an easy to understand fashion. This minimalist, ergonomically created flow was only created by mass research into the HUD factor and understanding of the elements that build both easy and enjoyable FPS and RPG’s. One feature of the HUD should be that the health and experience bars, and weapon information, should become completely transparent when not in combat (only when the health bar is full, and the weapon is fully reloaded). Often underestimated, the HUD is a powerful tool that should be optimised to create the best possible playing experience for the player.